HAMPTON, Va. – The Central Intercollegiate Athletic Association (CIAA) anticipates the largest Tournament in the history of the iconic Conference. The planning committee prepares to celebrate the 100th anniversary milestone during the week-long 2012 Tournament on February 27 – March 3 in Charlotte, NC. Conceived on February 4, 1912, the CIAA has grown into a cultural phenomenon and arguably one of the most influential mechanisms in all of Black America and giving birth to one of the country’s greatest, most financially successful event in all of black college sports. The first CIAA Tournament was created in 1946 on a $500 budget. Over the past 13 years alone, the CIAA Tournament has generated over $269 million in economic impact for the state of North Carolina and over $17.1 million in overall scholarship dollars for CIAA member institutions. The CIAA is a trailblazer and often referred to as “The Conference of Firsts”. A few of those firsts include the first football game between two African-American-colleges in 1892 (Livingstone College and Johnson C. Smith University – known then as Biddle University); the first NCAA Division II conference to have its tournament televised as part of Championship Week on Entertainment Sports Programming Network (ESPN); was featured in the ESPN film, Black Magic, directed by Dan Klores, which was the first documentary to set a network record on its first night averaging a 1.2 million household and 1.55 million viewers; and in 2009 became the first African-American athletic conference to vote a non-HBCU institution, Chowan University, as a full-member, which supported the CIAA’s commitment to building a diverse and competitive conference. The CIAA’s focus on education, a by-product of its annual Tournament, is an important initiative that has been a part of the fabric of the Conference from its formation. The CIAA’s partnerships with its corporate sponsors have led to hundreds of jobs and internship opportunities and millions of scholarship dollars for its students. Sponsors donate annually to the CIAA General Scholarship Fund (GSF) and actively participate in the annual CIAA Career Expo. The CIAA’s Education Day introduces Middle and High School students to the CIAA educational experience through its member institutions by providing information and on-site admissions for high school seniors. Over the past six years, the CIAA has drawn over 10,000 students to Education Day, many of which were accepted to CIAA member institutions. In an effort to continue to support the CIAA’s mission to provide educational opportunities for students to attend any CIAA school, we are asking our alumni and fans to make a donation to the CIAA GSF by visiting www.ciaatournament.org/donate. The CIAA is home to legendary coaches and extraordinary athletes who have helped the Conference receive proper recognition and respect in the world of college sports. CIAA legends and NBA Hall of Famers include John McLendon – the Father of Black Basketball, Clarence ‘Big House’ Gaines – the first African-American coach to win a NCAA Championship, Earl ‘The Pearl’ Monroe, Earl Lloyd – the first African-American to play in the NBA and Sam Jones. Other CIAA greats include Pee Wee Kirkland, Rick Mahorn, Fred ‘Curly’ Neal of the Harlem Globetrotters, Alvin ‘Al’ Attles, Jr., Boddy Dandrige, Charles Oakley, Ben Wallace, Ronald Murray, Darrell Armstrong and Celeste Trahan. Fans can enjoy a multitude of prizes and free trips in honor of the centennial celebration. The CIAA 100th Anniversary Sweepstakes has a grand prize trip for up to six people to any Wyndham Resort in the word; airfare not included. Fans can enter the sweepstakes through the CIAA Tournament’s Facebook page. Smaller prizes will be given away weekly by randomly selecting fans from our sweepstakes database. Prizes include official event and game tickets, gift cards and tickets to the NASCAR Hall of Fame courtesy of Food Lion, a Toyota prize pack and official CIAA 100th anniversary premium items. The CIAA is slated to launch its first-ever mobile application in November, which is available on iPhone, iPad, Blackberry, and Android phones and tablets. Fans can simply visit Apple’s App Store, the Android Market or Blackberry App World and search for ‘CIAA’ to download the mobile application to their mobile device or tablet. Fans that download the application are eligible to enter for a free trip for two people to Saint Lucia, which includes airfare and a free breakfast at the Garden Bay Hotel/Beach Resort. The CIAA mobile application was created to conveniently provide fans with instant access to key CIAA event information, updates and news directly to their mobile device or tablet. 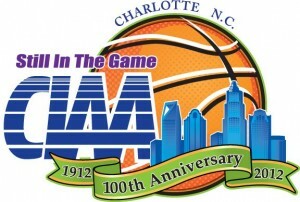 “The CIAA is excited with the momentum we have generated leading into the CIAA’s 100th anniversary celebration in 2012. We have the support of our loyal fans, member institutions and sponsors. As a team, we’re constantly enhancing the Tournament and affiliated activities to ensure the ‘CIAA Experience’ is as strong as ever,” stated Leon Kerry, CIAA Commissioner. Tournament attendees can anticipate an exciting week of events, activities and star-studded appearances during the 100th anniversary celebration. Returning event favorites include the Toyota Fan Experience at the Charlotte Convention Center and McDonald’s Super Saturday at the Time Warner Cable Arena; both FREE of charge. At the Toyota Fan Experience, fans will have an opportunity to check out the special CIAA 100th anniversary display that will showcase historical memorabilia and offer interactive activities for fans to participate. The CIAA is also developing two customized signature banners for Tournament attendees to sign throughout the week. One signature banner will be located at the Time Warner Cable Arena and the other will be located at the Toyota Fan Experience. Following the Tournament, the CIAA will donate one of the banners to the Harvey B. Gantt Center as a reminder of the great partnership between the city of Charlotte and the CIAA, as well as, to signal the historical mark this partnership has played in the growth and recognition of the CIAA. The second banner will be permanently displayed at the CIAA office in Hampton, Va.
Other returning official CIAA events that require purchasing a ticket includes the McDonald’s Step Show Throwdown at the Grady Cole Center, the CIAA Coaches’ Social featuring The Manhattans and the 100th Anniversary Celebration After Party featuring The O’Jays, which will both take place in the new Crown Ballroom at the Charlotte Convention Center. New additions to the CIAA official event line-up includes the CIAA & V101.9 Greek Day Party at Coyote Joe’s, the CIAA Adult Skate Party at Starlight Skating Rink, the CIAA High School Step Show Step-Off at the Grady Cole Center, the CIAA Champions Day on Sunday, March 4 at the Toyota Fan Experience in the Charlotte Convention Center and much more to come. For more information about how to purchase tickets and a complete list of official events, fans can visit www.ciaatournament.org. I would like to have more information on Adult Skating Party, Day Party for adults and college students and information on events for school age students.